Although it is a man’s world, run by men, the subject of masculinity is passed over in silence in many cultures, and subjected to the hastiest judgments in many others. Lost, between doting and impatience, is a helpful understanding of one half of humanity. So a short story collection that promises to “deftly capture… the world of men; the desires that drive them, and the impulses which bring them down” is instantly eye-catching. 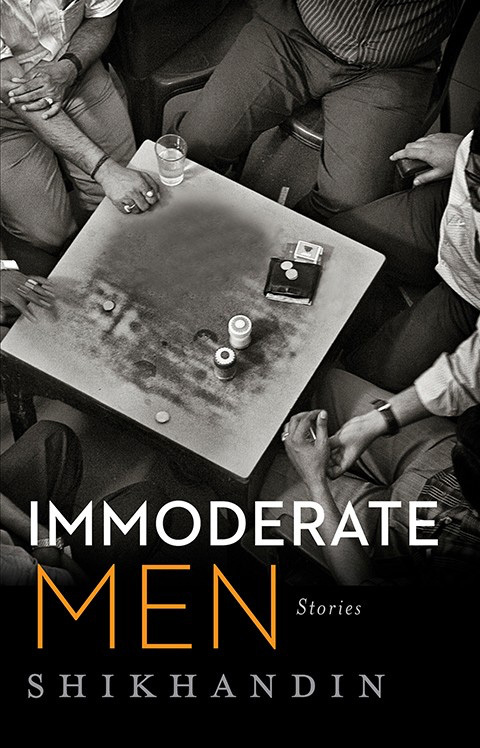 And when it is titled Immoderate Men, one’s expectation is that it will illuminate the radical nature of masculinity, which is capable of rising to incredible feats and sinking to a wretchedness that is difficult to believe unless one is a man oneself – and even then. Now, the author of this collection has kept his or her identity a secret, adopting the pseudonym of “Shikhandin”, which calls to mind the famously gender-fluid Shikhandi of the Mahabharata. But whether we are reading a woman or a man, the gaze we are introduced to is feminized to an unwise degree. Far from getting a glimpse of “immoderate” men, we see only highly moderated and emotionally confined men, who neither blossom nor wither in any visible way. The result is a falsity that is exactly converse to the male stereotyping of women, one we are all familiar with, which casts them as either femme fatales or greatly virginal. Nevertheless, this gaze (like that gaze) is authentic, and its shortcomings are not malicious. “He lies down on the ground beneath his roses, on his back gazing at the sky, now a benign blue above him…The scent of roses descends, heavy and inviting. He turns over and buries his face into the soil.” “We understood, but did not utter the words that sat like stones in our throat, corking up the agitation within.” “Old sorrows and a half-digested lump of anguish heaves in his breast. The pain grows intolerable after a while and the bitter tears roll down his cheeks. Sardarji shook his head and sat tight behind the wheel… Patwari said nothing. He simply bent his head and inhaled deeply.” “Nityananda stood there taking it all in, and felt his heart cracking under the weight of sorrow. His eyes stung, but the tears remained unshed.” And so on. Meanwhile, it is Shikhandin’s women who are dynamic, whether in creating trouble or resolving it. They, variously, seek their pleasure, torment their husbands, comfort the men and move the plot. The contrast is made especially stark in the story, “Hijras on the Highway”, where a young woman in trouble receives no help from the men on a bus. This is not because they don’t want to help, but because they are timid and self-conscious – while the women gather together and come to her rescue, in an almost filmi fashion. Now, I don’t doubt that all this is well-observed, and in a sense, true to life. It dovetails with the clichés about effete Bengali men, but we may accept that clichés exist for a reason. Yet, the same holds good for, say, the femme fatales of hard-boiled thrillers – they too are well-observed and founded on some reality. However, it is a lazily understood reality, because the actual tendencies of people’s characters are discovered beneath the surface – if one cares to make the effort. Moreover, neither mannequin-like women nor watered-down men justify entire books about them. What they do yield is a guilty pleasure for those writers and readers who are so inclined. Consequently, there are a fair few weak stories in this collection, mere flights of fancy, chunkily put together, that call to mind creative writing exercises from high school. But there is also evidence of much greater literary skill. Finally, it is also to Shikhandin’s credit that this book about men does not lapse into any hatred of men, which is not an easy feat in the times we live in. But the subtle condescension, and the lack of rigor, weaken what could have been a fine collection, and remains a very readable one. 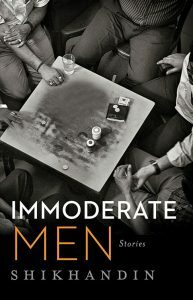 Immoderate Men is a collection of short stories that explore the households and streets of post-partition to modern day Bengal. Written by an author who goes by the pseudonym Shikandin, the book contains 11 stories, each different in style, approach and content. As the name of the book indicates, all the protagonists in it are male. The author’s choice of pseudonym, which is based on the story of the princess Amba from the Mahabharata, seems to have no particular connection with these stories. In the book, chauvinism, patriarchy, and the male psyche are explored in an interesting and honest manner. Relationships and social interactions between people of various social classes are explored in different settings and situations, though the focus remains on the middle class. Though each story is very different from the others, the book highlights the shared experiences that most couples and families go through, such as sweet or sour marriages, the different sorts of love for a spouse or partner, and their unique interplay. The book humanizes every character so you can feel for them despite their humanly flaws. The stories themselves follow a slice-of-life sort of narrative structure—there is no clear beginning, middle, and end. For example, the story Stolen Spoons follows the curious spoon-stealing habit of a long-married couple, and sort of meanders from the present to the past to the present again. The story Black Prince cleverly sheds light on the delicate and complicated marital woes of a man while telling us the story of the man’s love for his rose garden. Salted Pinkies, arguably the cleverest story in this book, tells the story of one stormy evening in a street-side tea stall somewhere in semi-urban Bengal. Keeping this rough structure in mind, there is still a lot of variation. Mail For Dadubhai takes the idea of an epistolary novel but uses email instead of real physical letters to tell us about the somewhat one-sided relationship between a grandfather and grandson. The stories range from naughty to meditative, vengeful to calm, and from life-changing to the mundane day-to-day. One of the strongest reasons that this book works is that each story, while talking about a subject that may or may not be that interesting, also exposes us to the cultural milieu and traditions of the time and place it is set in. Some of the stories, though pedestrian in their subject matter, are exciting because of the underlying dynamics of the situation. The author also makes the brave decision of writing in colloquial Bengali English in the last two stories, and you can’t help but imagine how it would sound. This adds a lyrical quality to these stories. There are stories of triumph and despair, of abundance and loss, of pain and of happiness. They poignantly bring out the humanity inside people in the most mundane of situations. They dare to treat love as differently as human beings experience the emotion, and bring either tears to our eyes or laughter to our lips. And then there are some stories that have no moral or message, but just are. In most of the stories, you are able to empathize with the characters simply because you can see the rigid traditions they must follow, the complicated dynamics they must negotiate, and the trials that they must face even if drowsy with fatigue. The book, however, is not perfect. The first few stories feel incomplete, and invoke the same feeling as when the end credits of a movie start rolling before the story is satisfactorily resolved. After reading the first few stories, though, you know what to expect (no proper climax). Some of the stories, and especially Stolen Spoons, try to spring a surprise in the end, and it is disconcerting because it is often hard to connect the offending sentence with the rest of the (perfectly coherent) story. All in all, this book is a highly recommended read. It will leave you ruminating and wondering for days afterwards.